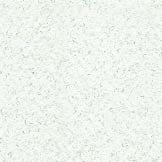 The Valigetta is a one piece white box with an embossed, glossy white flower pattern. It is FDA approved for direct food contact. The Valigetta box looks like a tote with a handle on top. The dimensions of this box are 2-5/8" x 1-1/4" x 2". 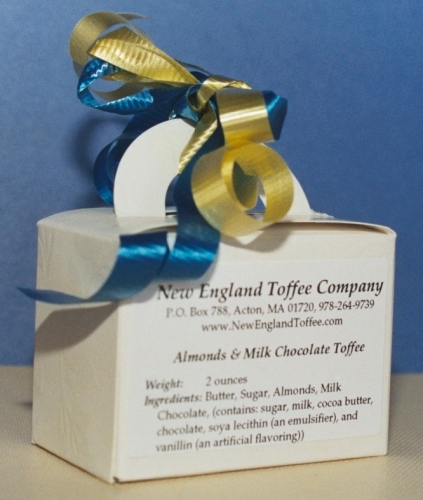 The box is tied with two 3/8" curling ribbons (your choice of colors) and comes with your choice of toffee. 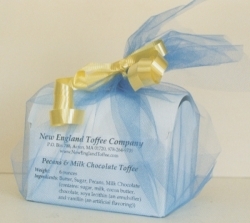 A Valigetta party box holds 2 ounces of toffee and sells for $3.50. 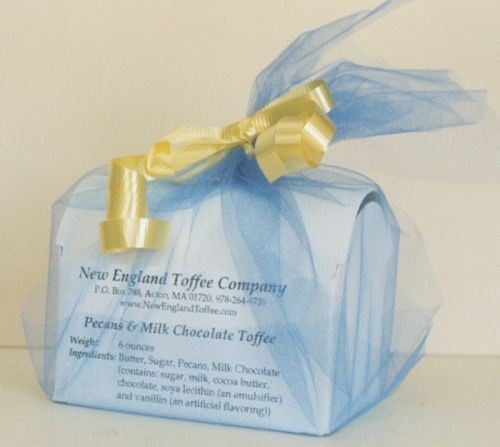 This Italian Confectionery Box makes an ideal party favor. It is elegant, yet simple, and works well for any type of party, such as birthdays, anniversaries, baby and bridal showers and weddings. Discounts are available on orders over 50 boxes. Contact us for more information. Use our Special Requests Form to obtain a price quote or for questions on customizing your ribbon colors.There are currently 2 left. The Bauletto is a one piece white box with an embossed, glossy white flower pattern. It looks like a trunk, and has dimensions of 3-7/8" x 2-3/4" x 2 7/8". The box is FDA approved for direct food contact, and comes with a 4 ounce clear cello bag of toffee. The Bauletto party box comes wrapped with 2 pieces of tulle netting (across length and width) and is tied with a 3/8" curling ribbon (your choice of tulle and ribbon colors). It sells for $6.50. This box may be wrapped many different ways. We would be happy to accomodate your requests or to suggest alternatives. Also, discounts are available on orders over 50 boxes. Contact us for more information, or use our Special Requests Form for your questions.